Geeta Dayal reviewed 10 PRINT in Slate. As far as I know, this is the first published review of the book, and I greatly appreciate how it traces the discussion of mazes and other topics, pointing out the many cultural and well as technical touchstones. Over at Stack Overflow they have a nice thread going with several shell scripts that implement 10 PRINT. Daniel Haehn has written a 3D version of the 10 PRINT program in WebGL. And my lab’s server is back up after a power outage here in Cambridge, MA, so the PDF of the book that was hosted there is once more available. 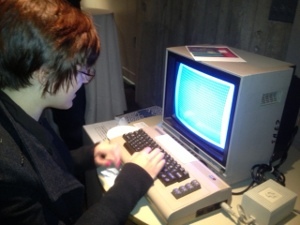 Our event at the Boston Cyberarts Gallery (with me – Nick Montfort – Patsy Baudoin and Noah Vawter) went very well, with the gallery full for the salon and people willing up after the discussion to come program on the two Commodore 64s that we brought. There were some fascinating variants developed, too. Thanks to George for setting this up for us and to Dan and Bill for getting the space set so that the C64s could be powered up and connected to a projector. 10 PRINT was “coded” by 10 writers. However, rather than producing yet another academic anthology made up by independent parts, they made a coherent single “intellectual software” which executes beautifully. We have a site for the book now at http://10print.org – you can download the entire contents, Creative Commons licensed, from the site there in a 50MB PDF. We’re happy to follow up on how the original program was shared in the 1980s by sharing our book in this way. Finally, Casey Reas, our co-author and the designer of the book, has posted a set of photos of the 10 PRINT book. These are very effective in showing the care that Casey took in putting together the book, and how well it communicates the insights we reached together – and why you may enjoy reading the physical, printed 10 PRINT. As seen on Bruce Sterling’s blog, we have an 10 PRINT (or, to be precise, a 10 PRINT CHR$(205.5+RND(1)); : GOTO 10) event tomorrow, Wednesday, here in Boston. The Boston Cyberarts Gallery (formerly AXIOM) is located in the Green Street T station on the Orange Line; the event’s at 7:30pm. 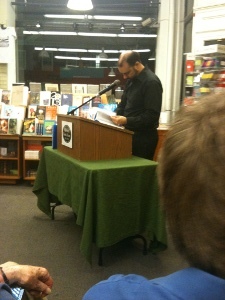 An evening to celebrate the publication by MIT Press of 10 PRINT CHR$(205.5+RND(1)); : GOTO 10. 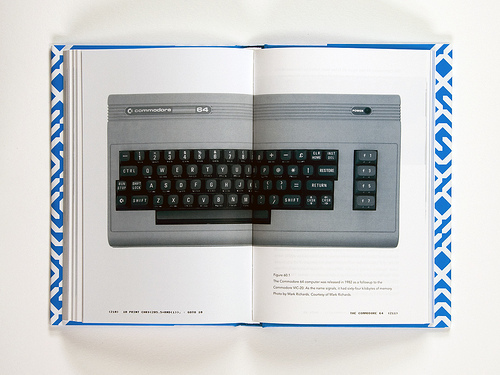 This book takes a single line of code-the extremely concise BASIC program for the Commodore 64 inscribed in the title-and uses it as a lens through which to consider the phenomenon of creative computing and the way computer programs exist in culture. The ten authors of this collaboratively written book, treat code not as merely functional but as a text-in the case of 10 PRINT, a text that appeared in many different printed sources-that yields a story about its making, its purpose, its assumptions, and more. They consider randomness and regularity in computing and art, the maze in culture, the popular BASIC programming language, and the highly influential Commodore 64 computer. Nick Montfort will start off the evening leading a discussion among co-authors and the audience about this celebrated piece of software. And there will be a short hackathon. ATNE Salons are informal discussions on art/technology topics. At each event, we start the discussion with a presentation by an expert in the field who’ll provide context and raise provocative questions. Next, with the help of a moderator, we turn the debate over to you. Share your ideas, discover new ones and participate in analytical discourse and artistic cross-pollination. The deadline for E-Poetry 2013 (to take place in London, at Kingston University) is almost here – sumissions are due December 1. The festival will take place June 17-20. Sometimes I encounter language that sounds like it was computer-generated, or that sounds like it would be even better if it was. Hence, the slapdash “Lede,” which is based on the first sentence (no, not the whole first paragraph) of a news story that was brought to my attention on ifMUD. This very simple system does incorporate one minor innovation, the function “fresh(),” which picks from all but the first element of an array and swaps the selection out so that it ends up at the beginning of the array. This means that it doesn’t ever pick the same selection twice in a row. I love the concept. I haven’t seen it in action myself, because of my use of a manually-implemented “DeFacebookizer” that, rather than enmeshing me in the most direct possible corporate system of social control and structure, leaves me with only the heterogeneous, diverse, and open communications from people on the World Wide Web. The Web is not a pure wonderland, though. These sorts of communications are, of course, also continually subject to statistical analysis and displays of counts – how many comments on a blog post, for instance. To intervene in the count-obsession of digital media, it makes sense to go to where it is most prominent. Grosser discusses his deaugmentation of Facebook in an interview with Matthew Fuller. The website is being prepared now, but a call for proposals (with further information) is already out. The deadline is December 31, 2012. Our book 10 PRINT CHR$(205.5+RND(1)); : GOTO 10 has been printed and bound and is making its way to bookstores now. It’s featured in a current exhibit at Hampshire College, and three of us ten co-authors did a reading to celebrate the release at the Harvard Book Store yesterday, where the first copies were available. 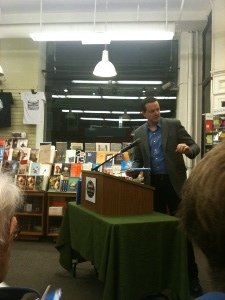 Our reading at the Harvard Book Store drew a sizable crowd, including MIT colleagues from Comparative Media Studies / Writing and Humanistic Studies and the Literature section; comrades in the People’s Republic of Interactive Fiction, librarians, and local free software folks and hackers, among others. The three of us read some short excerpts from the book and discussed the project, first with each other and then in response to questions from the audience. Several people assumed that the book was a collection of individually-authored articles, which is not a surprise, since that’s usually how a book like this is done. So we spent some time explaining the process of collaborative authorship that we used. The photos here are of me (Nick Montfort) on the left, then of Patsy Baudoin and Noah Vawter. Meanwhile, back in Western Massachusetts … and specifically at Hampshire College, the exhibit “Pulp to Pixels: Artist’s Books in the Digital Age” is on until November 16. The exhibit is curated by Andrea Dezsö, Steven Daiber, and Meredith Brober, is part of the “Non-Visible and Intangible” series, and is located at the Harold F. Johnson Library. There’s a news item about the exhibit and site with curatorial descriptions and documentation. 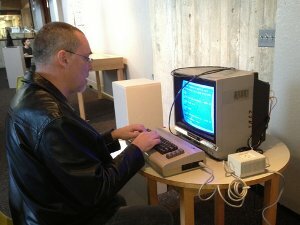 Below are photos of John Slepian, who offered his Commodore 64 for the exhibit and set it up, and a gallery visitor enjoying a 10 PRINT variant. By the weekend, 10 PRINT should be available in fine online and brick-and-mortar bookstores, including my other main bookstore in Cambridge, the MIT Press Bookstore. We hope readers will enjoy the project, and that it will also be an invitation to think about collaborative research and scholarship in the humanities in a new way. Illya Szilak interviews Nick Montfort in the article “The Death of the Novel: How E-Lit Revolutionizes Fiction,” the first of a series of posts on electronic literature. I was at a workshop in Bergen on Tuesday and a conference in Edinburgh Thursday through Saturday. There were many interesting things to report or at least mention, and I’ve only managed to note two of them on the blog so far. I’ll also mention that in Bergen, I did the first transverse reading of the full ppg256 series, reading through the seven generators’ output four times. 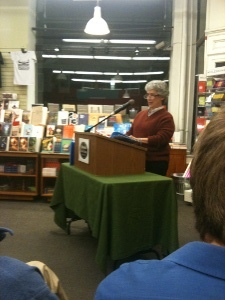 I was very pleased with the art gallery setting, the other readings and screenings, and the way my reading went. Fortunately there is good documentation of both events in the ELMCIP Knowledge Base, a resource that lists critical work, events, and presentations about electronic literature as well as works of e-lit themselves. For these two events, abstracts and (in the case of the “Remediating the Social” ELMCIP conference in Edinburgh) full papers are included in the Knowledge Base as well. And, my keynote address at the beginning of the ELMCIP conference in Edinburgh was “Programming for Fun, Together,” for which a corresponding paper is available. I covered the main topics of the paper in about the first half of the talk and spent the second half trying to explain how to program in Commodore 64 BASIC, using concrete-poem-generating programs (including 10 PRINT CHR$(205.5+RND(1)); : GOTO 10) as my examples. I began by developing a program that prints “H” or “I” at random, using bpNichol’ favorite letter (“H”) and an adjacent letter that can be seen as either a rotation of “H” or a component of it. A one-line program was developed to printing either one uniformly at random. In part, this was my response to the less interesting but certainly more conventional “HELLO WORLD” program. I continued to show how a program that printed “x” or “y” could be quickly developed by modifying this one, after using Commodore BASIC itself, via the ASC function, to determine the appropriate new ASCII code. Then, I converted that program to “our” 10 PRINT (that is, the program I and nine co-authors have written a book about) and showed how the distribution and pair of characters could be changed. In presenting these various 10 PRINT programs and developing new ones through modification, I wanted to show that BASIC programming can truly be undertaken in an exploratory way without a great deal of background. I also wanted to share with the group some of the amazing facility for poetic experimentation that is provided by a 30-year-old computer, inexpensive even at the time, that allows you to program immediately after being turned on. Jill Walker Rettberg liveblogged my keynote (bringing back another wonderful historical tradition in digital media!) and there was also some discussion of the talk on Twitter. My only regret related to the talk was that Rita Raley, who was scheduled to be the respondent for my talk, was unable to make it to the conference due to the storm damage and flooding in New York City. Scott Rettberg filled in and made a worthwhile connection from collaborative, social programming activity to collaborative writing, also questioning my four points about programming socially for fun. The Edinburgh conference, which featured an exhibit at the Inspace gallery and performances throughout, resulted in a book that includes not only academic papers but also “artist’s pages” documenting the artistic works. I hope you’ll be interested in taking a look at the good supply of online “Remediating the Social” material. Jason Huff and Mimi Cabell did an excellent conceptual writing project, just presented at ELMCIP in Edinburgh. Here at the ELMCIP “Remediating the Social” conference, literature professor Yra van Dijk was added to the program and presented, today, on a topic of special interest to me – the interactive fiction community. She has been examining the 2001-2004 exchanges on the IF newsgroups (rec.arts.int-fiction and rec.games.int-fiction) with a focus on the online exchanges and the community’s archiving of them. Self-reflexivity and longevity makes this community particularly interesting to her. She sees a blending of roles: Practicioners, reviewers, and consumers are different roles but not different people. Her study uses literary sociology and literary theory, mainly Latour. She mentioned the “Interesting discussions” available on the Wiki; one does not have to join a mailing list to read them. Technical issues, theory and self-reflection are discussed – many things that would be taken up by institutions in other contexts. She noted that actors on the newsgroups do not behave as if anonymous, but behave as they might in person. She noted as well that some in-person meetups now happen, that people often reflect on how to raise the profile of IF, and that awards and prizes imitate hierarchies of print literature, play a part in canonizing and archiving. She studied the consideration of IF as art – and found that most of the discussion is about craftsmanship, not poetics. Exchanges of code happen, and people discussed questions about how to write, not what we write. She found that a well-defined genre is being redefined through discussion. Taste is being developed and discussed; intelligent readership is supported. An archive of knowledge about these works has been produced, along with an institutional network. So, the seemingly peripheral IF community has many interesting things happening. It resembles (to her surprise, she said) the 19th century literary communities with their emphasis on craftsmanship and criticism. I regret that I didn’t get to speak with van Dijk, but it was great to hear her discussion of the IF community … and I have now something to report on at the next People’s Republic of Interactive Fiction meeting.